Winter vacations can be tricky to plan if you are trying to accommodate a variety of different tastes and preferences. Fortunately Swan Mountain Snowmobiling, along with our business partners, have teamed up to offer a wide range of winter vacation packages that the whole family will enjoy. West Glacier Lodge, owned and operated by Glacier Raft Company, is nestled at the top of 50 acres and located 1/2 mile from the West Entrance to Glacier National Park. This eight room lodge includes all your modern amenities to make you feel at home. Wake up to views of the spectacular peaks of Glacier National Park and then take in the beauty on the back of a snowmobile at one of Swan Mountain Snowmobiling’s many locations. Glacier Raft Company and Swan Mountain Snowmobiling are teaming up to offer you a packaged special that gives you 10% off a guided snowmobiling trip as well as well as your accommodations in their beautiful lodge. Please call 406-888-5454 for more information. The original stone fireplace of the Historic Tamarack is the perfect place to warm up after a day in the snow. 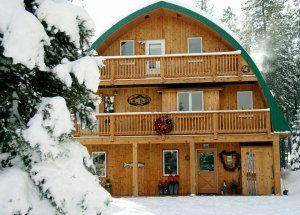 We at the Historic Tamarack Lodge and Cabins are excited to accommodate guests of Swan Mountain Snowmobiling. In celebration of being able to offer guests to the area an even greater choice of fabulous winter activities, we are partnering with Swan Mountain Snowmobiling to offer a 10% discount on all accommodations to snowmobile customers. 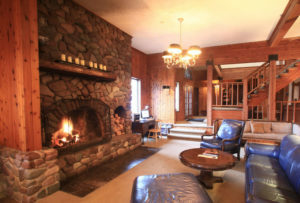 Known for our year-round outstanding hospitality, clean and comfortable cabins & lodge rooms, continental breakfasts and affordable lodging rates the Historic Tamarack Lodge, originally built in 1907, provides classic ambiance with modern amenities, 3400 square feet of rustic charm and still boasts its original over-sized natural stone fireplace and pole pine lodge architecture. 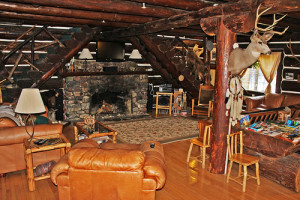 Play hard on the sleds, then relax with a hot toddy in the main lodge or on the private deck of your cabin accommodation. We look forward to welcoming you to the area and introducing you to miles of trails and unsurpassed vistas of our winter wonderland! Our cabins occupy 2.5 acres of an original Glacier Park homestead site, and are equipped with modern amenities. The Reclusive Moose is excited to offer a 10% discount on lodging accommodations to Swan Mountain Snowmobiling customers. Swan Mountain Snowmobiling will also honor a 10% discount on your snowmobile tour when staying with Reclusive Moose. Please mention your stay at Reclusive Moose when making your reservations. Our newly built and fully furnished cabins are located just minutes from the most popular snowmobile tour trailheads, and one mile from summer activities including fishing, swimming, and boating at the confluence of the Middle Fork and North Fork Rivers. From your cabin door, you are a 15 minute drive to the entrance of Glacier National Park, and from the town of Columbia Falls. Spend your day riding the hundreds of miles of groomed trails with a guided tour or snowmobile rental. 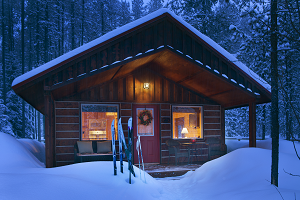 Return to your cozy and secluded cabin in the woods, to warm up and treat yourself to an unforgettable Montana winter experience. Come explore beautiful snow fields and see panoramic views of the National Forest adjacent to Glacier National Park and nearby wilderness areas. Each guest will drive a warm powerful sled with an experienced guide showing you the way. Then, enjoy the warmth and comfort of Kandahar’s great room with big crackling fire, outdoor hot tub and your room with down comforter and fur blanket. A perfect winter adventure. Package includes two nights lodging, free breakfast and your sledding outing. Lift tickets may be added.Price of package starts at $298/person ($596 double occupancy) and applies Dec 8-12, Jan 1-11 and March 18-April 7. Contact Kandahar Lodge to price the package for other dates. Package is based on double occupancy in a lodge room and half day snowmobile trip. Transportation to the the trail head may be added for $100 round trip. Take advantage of our snowmobile and lodging package: 10% off lodging and 10% off your snowmobile tour when staying at Moss Mountain Inn. Located only three miles from our most popular trail head at Canyon Creek, Moss Mountain Inn boasts comfortable chalet-style rooms. Unique to Moss Mountain Inn, guests enjoy a hearty breakfast accompanied by artesian pastries to get you started for your day out on the trails! 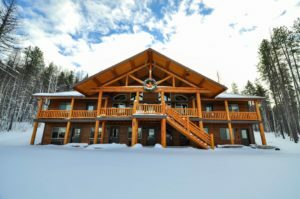 The Inn is an award-winning eco-smart bed and breakfast located on the western border of Glacier National Park, seven miles from the park entrance at West Glacier and a half mile from the North Fork of the National Wild and Scenic Flathead River. This stunning property is nestled among a picturesque setting of evergreens, perennials, and wildlife.With up-to-date amenities, and personal attention to detail at bed and breakfast we strive to ensure your stay with us is distinctive. Come, unwind, slowdown and experience Glacier National Park, the crown of the Continent and surrounding areas! After a full day of playing in the snow, what could be better than a hot meal or warm drink? Swan Mountain Snowmobiling is pleased to partner with the following restaurants and bars that offer great deals to guests looking to warm up and chill out after a full day of snow play. Glacier Grill – hearty home cooking and great beer! Skiing has long been the most popular winter sport around, but in recent years snowmobiling has become widely popular. This package offers guests the best of both worlds by allowing them to combine a guided snowmobile tour or snowmobile rentals from Swan Mountain Snowmobiling with a ski package from the following cross-country ski provider at substantial savings! The beauty of winter vacation packages is that the sky is the limit in terms of the possibilities. From unique lodging options to one-of-a-kind guided trips, we can combine our snowmobile tours or snowmobile rentals with nearly any winter sport to make your winter vacation truly unique and memorable. 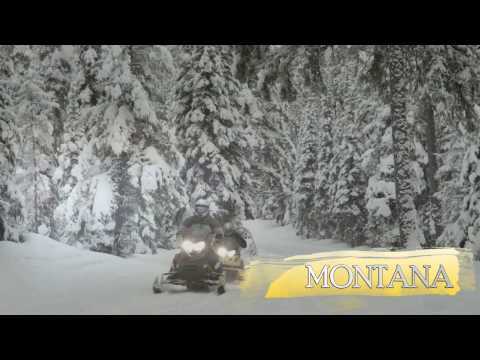 Find out why Swan Mountain Snowmobiling is your family’s best choice for snowmobile vacation packages in Glacier Country, Montana!